What potential complications are associated with a wrist arthrodesis? Can there be a guarantee for a successful wrist arthrodesis in every case? Does the plate have to be removed from the wrist later on? Please let me point out that this question requires the direct and personal exchange with your treating physician in order to establish what potential individual complications may be relevant to you. Therefore the following information may only be viewed as general guideline addressing some of the common complications known in connection with wrist arthrodesis procedures. Wound healing disturbances as well as superficial infections for instance are not uncommon in hands or iliac crests. Both scenarios can typically be addressed fairly easily through simple remedies. However, hands as well as iliac crests may also develop deeper infections which may require extensive revision surgery (for hands: the removal of the implanted plate for instance). In these cases the wrist needs to be immobilized with the help of a fixator. In isolated cases substantial secondary hemorrhaging may occur in hands or iliac crests that underwent a wrist arthrodesis procedure. These bleedings may require revision surgeries in order to identify and remedy the hemorrhaging blood vessel. I want to point out that the likelihood of this complication to occur is fortunately fairly low. Chronic infection following a failed wrist arthrodesis. The adjacent image shows a chronic infection after undergoing an arthrodesis. The wound healed up quickly after the removal of the plate. In nearly all cases within the first days following surgery a tendency to swell up has been noticed (applicable to both, hand and iliac crest) which however would diminish within a few weeks. Even the significant walking impairment after the removal of the bone material from the iliac crest will recede completely in almost all cases within a few days or weeks from surgery. In the event of larger blood losses – for example as a consequence of secondary hemorrhaging – in isolated cases it may be necessary to transfuse blood. This, however, would represent an exceptional situation. Cutaneous nerves in both, hands and iliac crests, may also get accidently damaged as a consequence of the procedure. This could manifest itself as decreased cutaneous sensitivity in the groin area and possibly of the sexual organs which may or may not have repercussions in a patient´s sexual life. As for the hand a loss of sensitivity in the vicinity of the scar and even in distal position to the scar is possible. In rare cases it is possible to hurt one or more extensor tendons on prominent or loosened screws as it/they may rub on the metal edge of the screw/s and – in the worst case – be completely severed. The concerned patient will only notice the injury once he/she is no longer able to actively stretch out one or more fingers. Once again, there fortunately is only a very small chance of incurring such complication. Should however one or more extensor tendon/s experience such injury, the concerned finger/s will have to undergo surgery to correct the problem. No. However, the surgical approach in more than 90% of the cases will lead to a solid wrist fusion within nine to twelve months, provided the patient allows for sufficient recovery time. It is of utmost importance to avoid putting strain on the operated wrist area for at least three to four months following surgery. Many surgeons will also immobilize the wrist with a cast or wrist cuff for several months to keep the operated area safe. The treating surgeon will decided on a case-by-case basis for just how long the immobilization should stay in place. The duration of immobilization is also depending on the bone density of the fused bones. The cast as well as the wrist cuff serve as “second protection” in addition to the internal fixation provided by the plate. Even when the wrist is immobilized through a cast all non-concerned finger joints along with the thumb joints should be kept mobile. 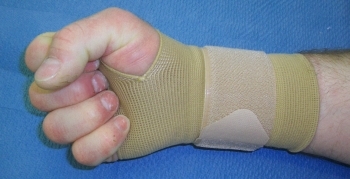 Wrist cuff used for post-operative treatment following a wrist arthrodesis. 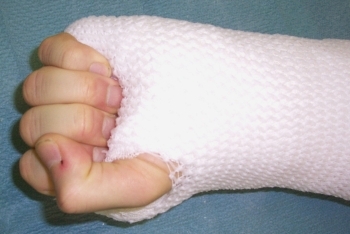 Image above: Regardless whether a cast or wrist cuff was used: The mobility of all fingers and the thumb after surgery is crucial in order to avoid mobility restrictions later on. Physiotherapy to improve finger mobility may be of true added value during this stage of recovery as long as the fused wrist joint is not forced into any motion. It is therefore advisable to make sure that the treating therapist is aware of the purpose of the surgical measure which in this case is the rigidification of the wrist. No. This is not a mandatory requirement. In the past many plates regardless of whether they were used in arms or legs had to be removed because the plate material (nickel, cobalt, chrome) was not exactly “tissue-friendly” which lead to damages of the tissue above the plate or allergies. Today most of the plates utilized for arthrodesis procedures are made of titan. That is a relatively tissue-friendly material. The plate along with the screws will “fuse” with the bone more and more over the course of months (osteointegration). Therefore it only makes sense to remove a plate today if either one of the plate screws loosens, the plate protrudes or bothers in any other way. Some patients do wish to have the plate removed as they do not wish to retain any foreign body in their organism. Should there be a need to remove a plate or should the patient wish to have the plate removed, it should not remain in the body for more than one to two years. If the plate is being left in the body for longer periods of time it may become very difficult if not impossible to remove it.